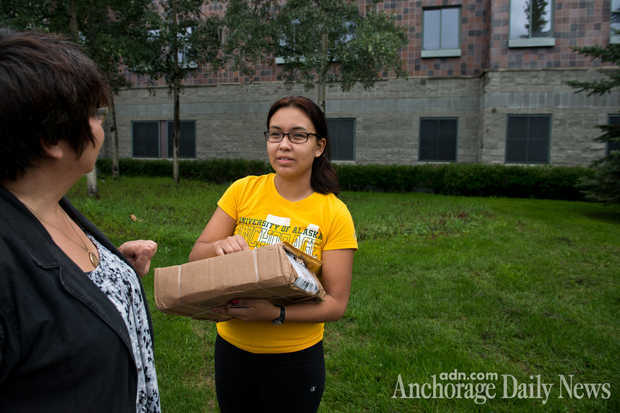 Carol drops off items for daughter Leah Morgan-Carroll at her UAA dormitory. 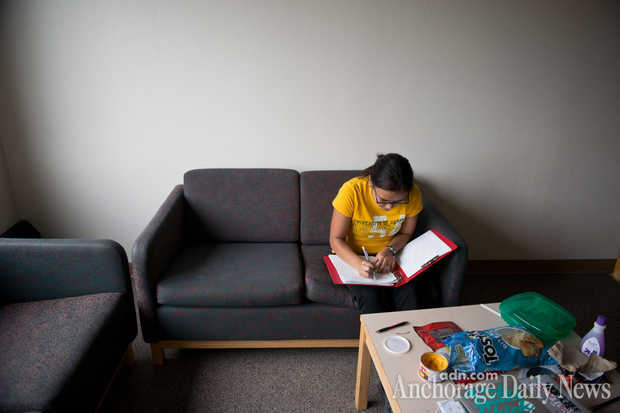 Leah began her first week of college classes this week. Her courses include Russian, English, math and photography. How important is it for you to explain to people that you have these FASD challenges? Leah: It just depends on what situation I’m in. If I’m just with friends or a roommate, I don’t think that’ll really affect the decisions or the relationship. But if I’m in a job that requires me to do something, or school, it would be more important to explain. At UAA, would it have been useful for them to understand? Leah: It would be good for the teachers to know. There are moments where I do just fine but there are moments that are more of a struggle, so when I do go through those struggles, they can know and help me get through it, instead of just, “Why are you doing this? You’re lacking more than usual today. What’s going on?” They could just understand why I’m struggling. Carol: Right, but it’s incumbent upon you to work with the teachers. We talked about all the different things you could do. Go to the teacher, ask for help with this or that, or find out if you can tape the lecture, find somebody to partner with that you could use their notes. Those kind of things. Leah: Now I want to go back to the part where you (asked) if I accept (my FASD). I kind of realize that in my everyday life I do accept it, but once it comes to trying to explain it to a teacher, I don’t like to talk about it. I don’t like to think I’m different, or have a struggle. I like to think I’m as capable as everyone else. Why don’t you like to talk about it? Leah: It is a little embarrassing. To tell a teacher I have a hard time taking notes or whatever, it’s just kind of hard to talk about. 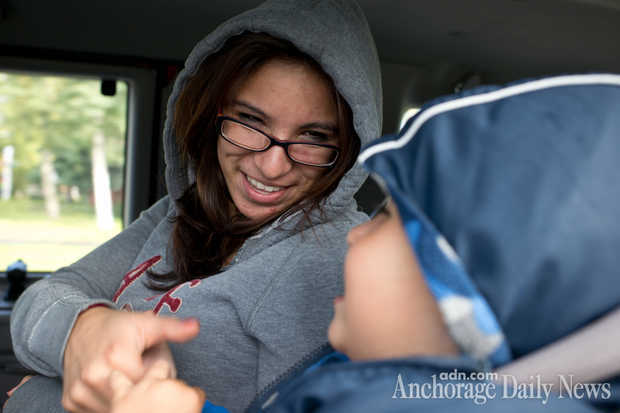 It’s awkward … I never talked to teachers at UAA about it. Simone says an old friend came to visit recently, and that was enough for her to slip back into old habits. “I guess I got triggered. I call one of my friends up because I know his neighbor sells meth,” she said. 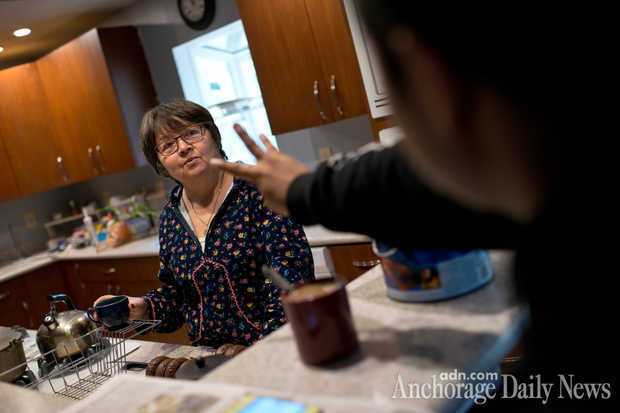 “I just go over there and start drinking, and then next thing you know I’m knocking on the neighbor’s door asking for a 50-sack.” She says she stayed drunk and high at a messy house in Fairview for about four days. She didn’t sleep. She remembers seeing a lot of other addicts hanging out on the street nearby. At the end of the binge, a sober friend took Simone to see a treatment counselor, who reminded her of a promise she’d made: If a relapse like this happened again, she would seek residential treatment at Clitheroe Center. She’s waiting to be admitted.